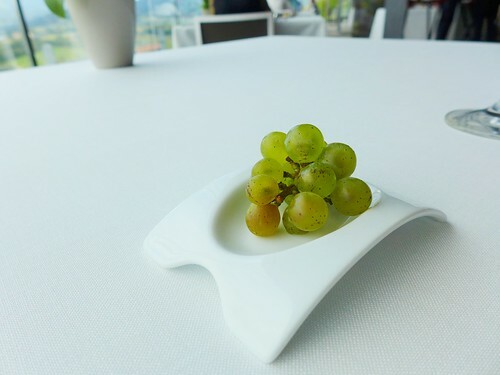 After being recommended to do so by my friends the Spanish Hipsters, I got a lunch reservation at Eneko Atxa’s 3 star restaurant Azurmendi, located just outside of Bilbao. 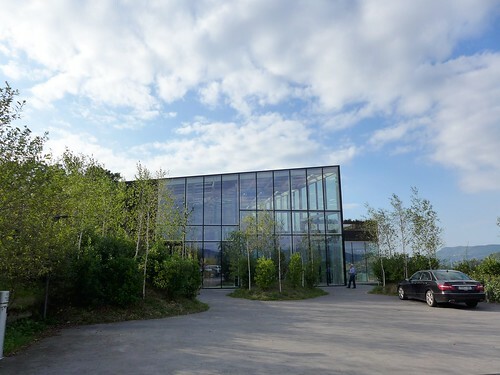 The restaurant building is entireley made of steel and glass and includes a greenhouse atop of the dining room. The dining room itself has a glass facade with a nice view of the Basque hills. Just a little unfortunate that a highway runs through this landscape. But honestly, in the end, this doesn’t matter at all. I was about to find out, that this meal wasn’t only about good food, but also about entertainment, about a journey. When I entered the restaurant, I wasn’t taken to the dining room. In the entrance hall, which has a tree in the middle, I am offered a glass of Txakoli, the crisp and fresh local white wine, and am then invited to a walk around the amenities. First I discover an outside garden on the backside of the restaurant, where Atxa and his team grow their own cabbage, lettuce, artichokes and other delicacies. 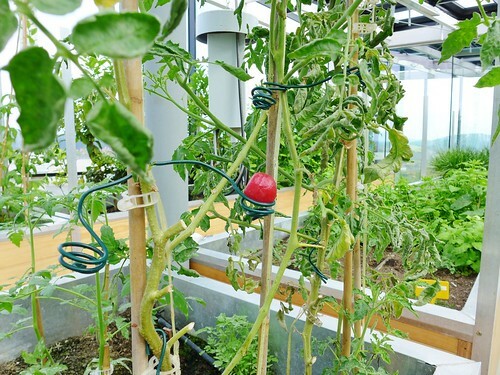 The green house on top includes a state of the art installation growing endangered local tomato varieties and other plants. Not all of these plants are used in the restaurant as the quantities aren’t enough, but this entertaining walk, the garden and the greenhousing tell a lot about the philosophy of the restaurant. Bringing local nature and modern technique together and taking someone on a journey. 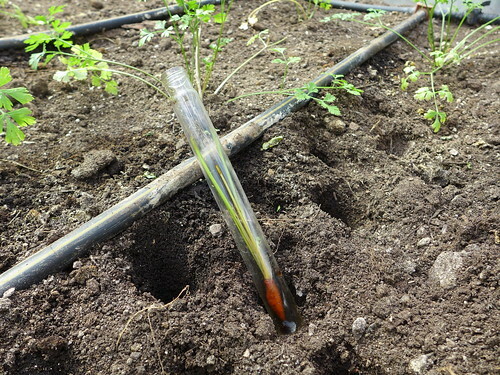 And as I follow my path through the green house… Surprise! 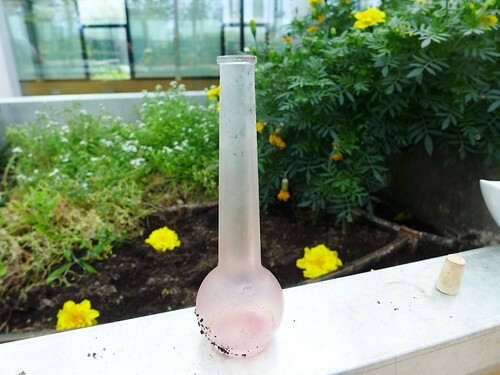 There are amuse-bouches hidden in the plants! First, I find this skinless tomato injected with raspberry juice that had to be eaten in one bite. The raspberry flavor doesn’t quite come through but it has a wonderful sweet and ripe cherry tomato taste. Then there is a cocktail containing grapefruit and… I forgot what else. But itA fresh, acidic and vitalizing palate-cleanser. A biscuit of pumpkin with pumpkin seed. Nice, although a bit dry and thus nothing spectacular. 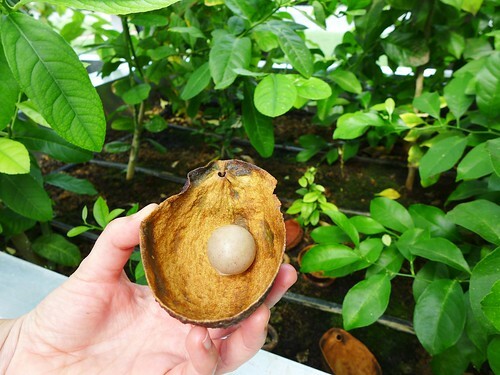 Virtual avocado nut made of avocado flesh with some cocoa. Smooth, nearly velvety and rich. An interesting and tasty bite. Raw baby-carott marinated in old balsamic vinegar – this has some good raw crunch. Finally, my favorite of all nibbles: oven-dried, crunchy topinambour-skin filled with a lemon emulsion. A genius idea resulting in great taste. Hard to describe how well these ingredients go together! 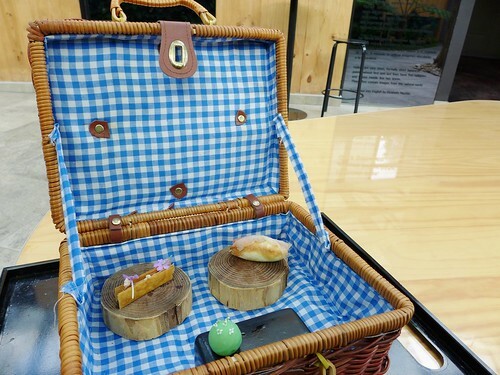 I am guided back to the entrance hall where a picnic basket with 3 more amuse awaits me. First an avocado “airbag” with confit ham on top. 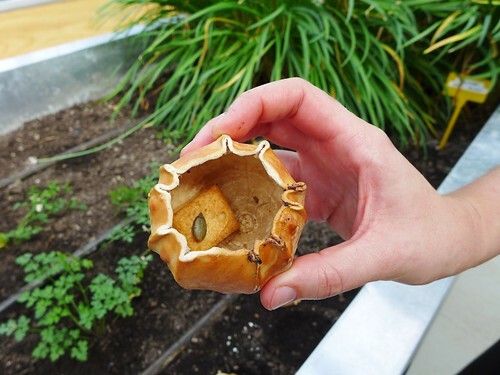 Inside the crunchy puff is a rich avocado cream – this works well. Then, another favorite, a mille-feuille with anchovies. What great quality of anchovy they have here, just amazing, and this one’s rich, just as salty as it needs to be, and works like heaven with the crunch of the millefeuille as well as with the glass of Txakoli. 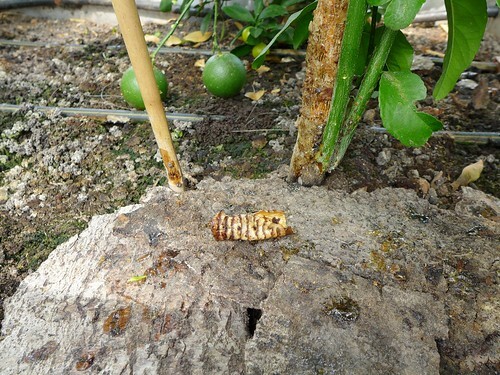 Finally the so called CaipiriTxa, a one-biter with liquid core. It is a kind of Caipirinha, where the Cachaca is replaced by Txakoli – again a genius idea holding as a great palate-cleanser. After that miniature picnic, I am still not being seated, as the waiter invites me to visit the kitchen. As I push the door to the kitchen, which is of impressive size, 30 or so chefs are greeting me at the same time. The very friendly Eneko Atxa then comes to me and greets me personally. What a warm and welcoming atmosphere! But that’s not all. Another (!) 2 nibbles are offered to me right in the kitchen. 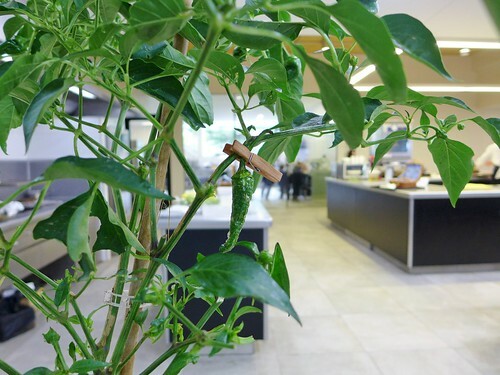 There’s a fried and salted pepper attached to the tree, waiting to be picked. Also, some kind of fruit punch, which is reasonably strong and spiced up with cinnamon is offered to me. This is all good but of course more for the fun and nothing spectacular. Wow. This walk through the amenities was really a great way to start the restaurant visit. As I think about it now, it really adds to a restaurant visit, as senses are probably being activated in another way. One feels much more involved and of course, it is a lot of fun. I guess the entertainment aspect is also one of Eneko Atxa’s big interests, and rightly so. On the table not only the menu and wine list are handed me for studying, but there are also two more crunchy bites in the shape of leaves. One is tasting of cepes and the other of chestnut. Talking about the wine list: as often in high-end restaurants in Spain, it contains many fairly-priced bottles, starting at 20 to 25 Euro. You gotta love this! I also receive a few just harvested Hondarribi Zuri grapes which are the ones used for making the local Txakoli wine. 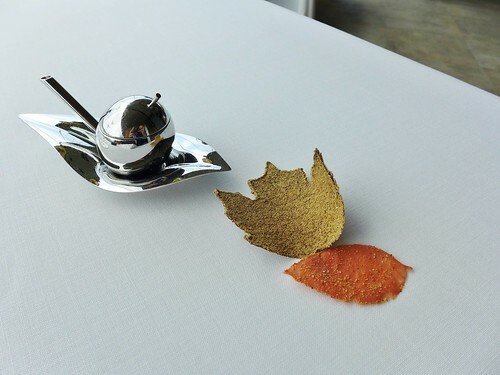 I really think that this is a great gesture which shows what Azurmendi is about, the local nature, the season. And most importantly it tells me “we want to bring on your table what’s good now”. Of course I have to think of the word “journey” again. 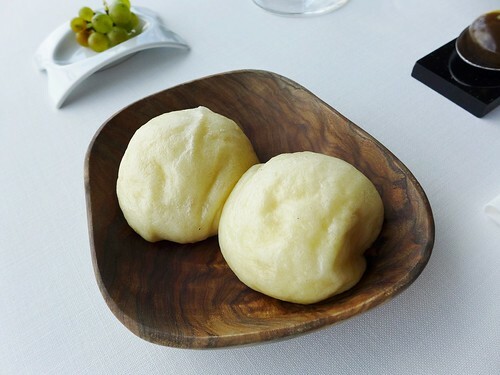 The first serving of bread, which is steamed and looks like an Asian dumpling tastes really really good. It is not too sticky, no too doughy, just right! And together with the excellent olive oil it is exquisite. Other served bread varietals were good as well, but nothing that requires a special mention. Then arrives the first starter: Egg from out hens, cooked inside out and truffled. THIS IS SPECTACULAR! A monster of intense, heart-warming flavor. It is no secret that eggs and truffles are a great match. But this one just puts an end to all truffle and egg experiments. Call it the egg-yolk and truffle standard. Excellent! Bloody “Mar” is a twist on the classic Bloody Mary containing sea urchin roe as a replacement of vodka (I assume). 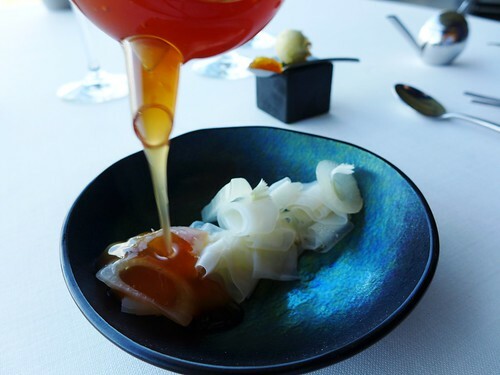 The roe of course adds intense ocean flavors which cut through the tomato-juice, the same way the alcohol notes of vodka would cut through a Bloody Mary. Also, it lends a certain creamy richness to the tomato juice which for some reason seems to lose part of its acidity as well. It’s the small pieces of celery placed on top of the crunchy bread strips that bring another nice flavor contrast. A nice one! 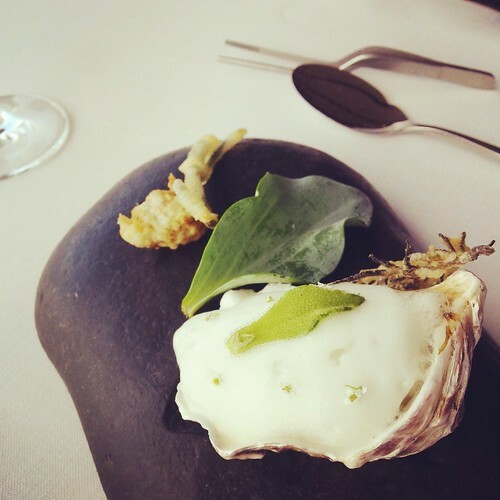 Oyster, vegetable and sea pil-pil accompanied by anemone and seaweeds. I was asked to start with the unusually large oyster leaf placed in the middle of the dish, which has a very gentle oyster flavor. I then tried the oyster itself, which has sea water foam on top. The oyster flavors are now just a little more intense and in general, there is something nice about these cautious, restrained oyster flavors as they enable a genuine freshness. The Gillardeau oyster hidden under the foam is a nice big specimen and has a fantastic sweet flesh, which also brings a superb contrast to the gentle sea flavors of the foam. The sweetness of the oyster flesh is emphasized by some mild oyster mayonnaise underneath. Tempura of seaweeds and anemone foremost add temperature and crunch. The whole combination tells something about the harmony of these creatures and plants from the sea living together, recreated on a plate. But well, maybe this is just a really good oyster dish. Tomato, cheese and basil tartlet. These tartlets are glorious. There’s warmth, richness, freshness and intensity of flavor flooding your palate with every bite. They are touching your soul straight away. 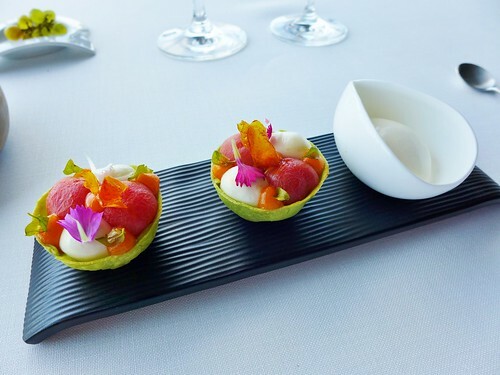 The warm and sweet tomato, the mild and rich goat cheese, the crunch of the very thin spinach tartlets (an art on its own to make them that thin). This reflects all the goodness that can be contained in a Mediterranean veggie dish (think of ratatouille or all other kinds of veggie tartes and quiches). Then the goat cheese ice cream brings a nice contrast of temperature and it also works very well as it has a very mild and harmonious falvors compared to many intensely salty and “goaty” ones I had before. This one even had a subtle and charming sweetness to it. This is wonderful. It appears like well-tasting simplicity but there is so much thought-through and functioning detail in this one. Excellent! Roasted lobster out of the shell on oil herbs and sweet chives. What a treat! 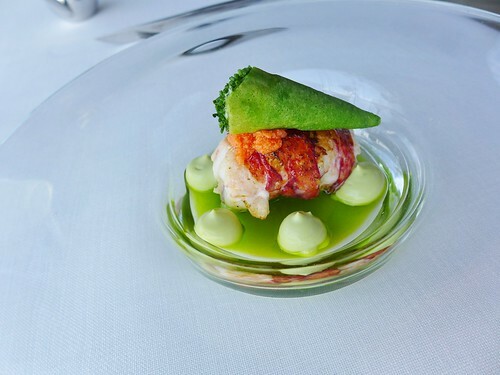 The lobster is first poached and then grilled which results in an exceptional quality on my plate. It is tender and flavourful in the inside and has slight crunch and great grilling aroma on the outside. 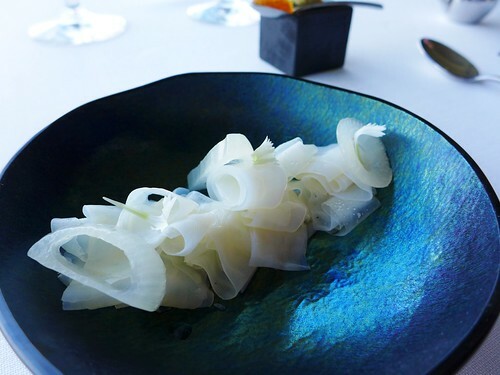 A superb symbiosis is created with herbs-infused olive-oil on the bottom as well as dots of herb emulsion on the side. On top of the lobster is a red lobster emulsion with a slight garlic taste and a cornet filled with marinated lobster meat. This sounds like a bit too many things on one plate but the lobster itself which has been handled so well by the chefs remains the star here and just tastes delicious. Very good! Squid noodles, crunchy and infusion. The squid is very thinly cut, so that it has the aspect of pasta and is just poached a few seconds I suppose. 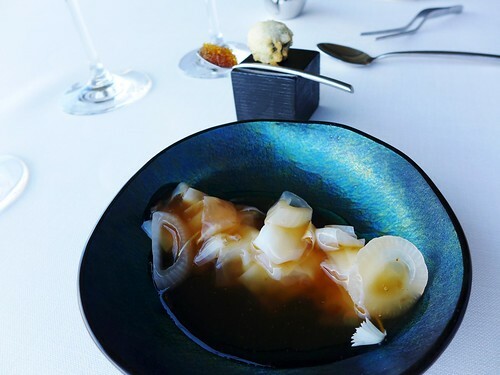 The cooking is finalized with a hot, thick and gelatinous squid broth – which adds lots of great umami. But I am starting this dish with a spoonful of tobiko roe marinated in soy sauce (on the side), which just tastes phenomenal. The only thing that doesn’t work so well is the fried cube filled with squid and squid ink, which I guess had the sole purpose of adding a temperature and texture contrast. It’s a bit soggy and can’t really add flavor. But on the other hand it doesn’t really impair the other flavors of the dish. Good. I can’t help but thinking that Eneko Atxa takes the journey much further than I would have expected, embracing flavors of Asia. But maybe it shouldn’t be a surprise knowing that he also worked in Tokyo for some time. With the squid I am offered a glass of 1999 white Vina Tondonia. What a great match. The slight oxidation tones of the wine interact so well with the umami of the dish. Chickpea stew. This is a very rich and thick chickpea and oxtail stew, including 2 crunchy ravioli of oxtail meat. 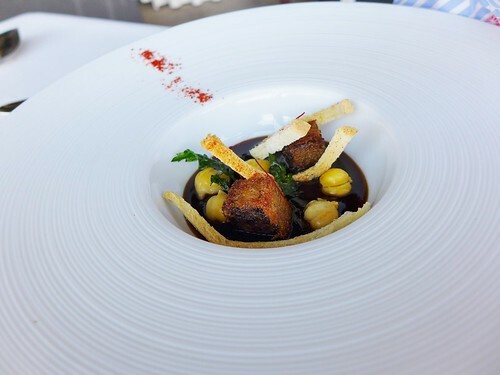 The sauce has both a rich oxtail and chickpea taste. The latter adding a certain kind of floury creaminess to the sauce. The crunchy twigs of bread have a slight paprika taste. A nice one. Also, I think it is interesting that this hearty meat dish is placed in between two fish courses, but it also makes sense, as I wouldn’t put this right before the pigeon and it adds a nice change of rhythm to have this before the equally intense tuna dish. White tuna belly, charcoal roasted and roasted red peppers infusion. I get the point if someone might say hat he would have preferred the piece of tuna belly a bit less cooked (and I admit that I would have preferred it a tad more juicy as well), but I think it is done on purpose that way, as the seared tuna belly just works to perfection with this genius rich, yet gloriously harmonious sauce with bold umami and pepper flavor (actually it reminded me more of the flavor of “pimientos de padron” than red peppers). I think it might not have the same effect when having it with raw tuna. Also, and probably for compensating for the lack of raw tuna belly, there are pieces of raw tuna, marinated in a soy and pimenton mix on the side. Another detail, the garlic flower and twig of chive on top of the tuna belly aren’t just decoration, as both add something to the flavor combination as a whole. The flower brings a subtle garlic touch and the chive a more bold, maybe a little sweet flavor. Both embrace the pepper infusion and the tuna belly in their own manner. Very good! 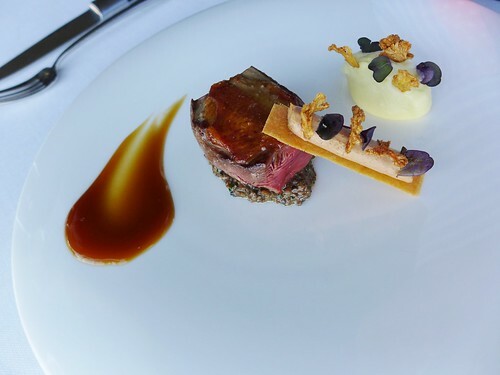 Pigeon, duxelle and cauliflower. The Pigeon, which comes from Navarra, is well cooked, even if the skin could have a little more crunch for my taste. It is lying on a duxelle, meaning a paste of finely chopped mushrooms. Then there’s a intense sauce made from the carcasse of the bird and a biscuit with a paté of the bird’s innards, which has a smooth liver taste. A rich cream of cauliflower adds more mild and sweet aromatics. Although this might not be the best pigeon dish I ever had, the combination of ingredients works well. Good. Dry croissant of fruits and creamy cheese ice cream somehow represents a pre-dessert. 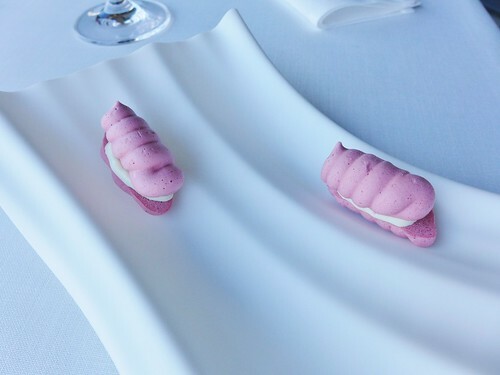 It is a meringue of raspberry filled with a goat cheese ice cream that is beautifully flavored with rosemary and thyme. 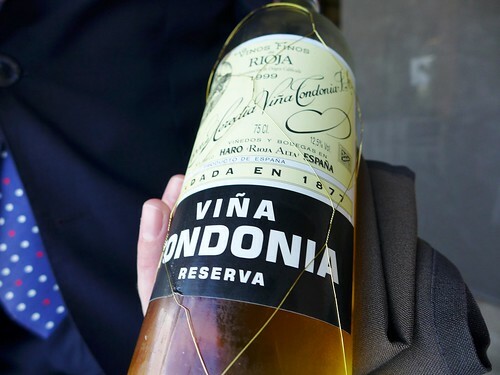 It is a great bite with an unexpected acidity and works as an excellent palate cleanser. 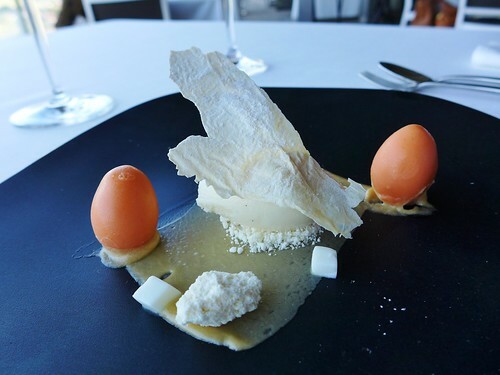 Egg and dairy products: farmhouse milk ice cream, butter toffee, “homemade eggs”, milk skin and gelee of yoghurt. A nice combination of flavors and textures and a good dessert. Apple. 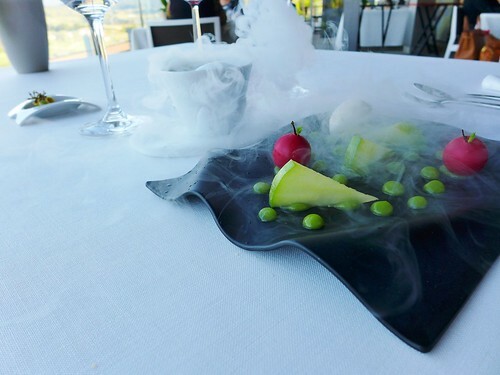 The dry ice is infused with herbs and apples and the fumes genuinely add some flavor instead of just creating an atmosphere. The whole plate transports apple aromatics in various forms. The tiny apples contain a sweet apple compote. Slices of apple rather appear acidic. There’s a lot going on here. Good! And finally: a few petits fours for the coffee. 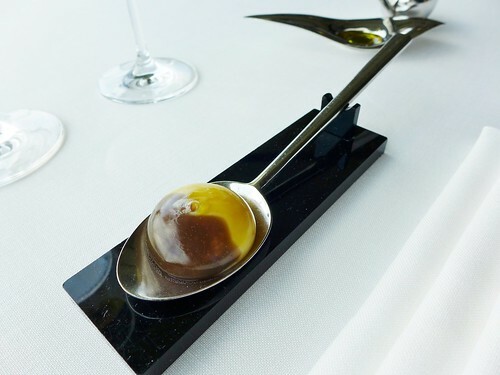 Eneko Atxa is a very talented chef taking his guests on a journey. A journey that not only lets them taste local flavors and the great products from the surroundings, but also combinations with far away flavors from Asia. 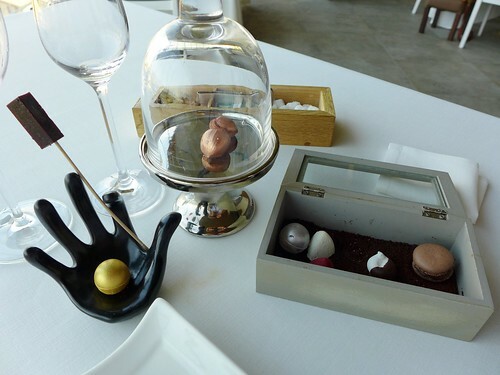 Atxa manages to combine all these in a very elegant and harmoious way, not too bold, not too subtle. I don’t think many chefs succeed this ride on a razor blade. He does. 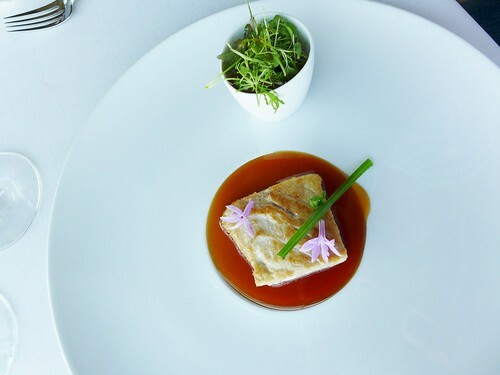 He puts some innovative and maybe daring combinations on the plate that amaze such as the tuna belly with a soy and red pepper sauce or a Bloody Mary with sea urchin. Maybe it’s because he and his team have the right skills and apply modern technique without a flaw even to classic combinations. The egg and truffle. The tartlets. The lobster. 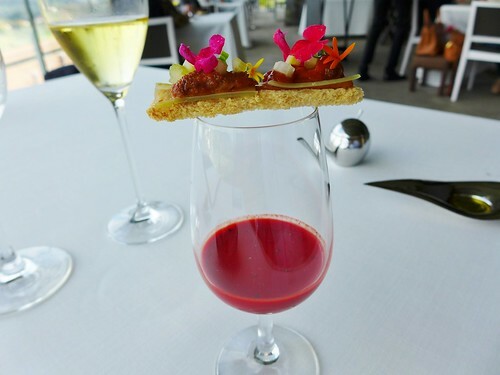 And what I equally like about Azurmendi is that one is literally taken on a journey. A walk around the building, the garden, the kitchen. There’s something genuinely welcoming and fun about this place. Just go there and find out. It is a meal that will leave you with a lot of impressions.